Geshe YongDong was born in the village of Ngawa, Amdo, Tibet in 1969. He made his initial decision to become a monk when he was seven years old after his mother had died and several monks were secretly in their home chanting mantras. One young monk, who looked only a little older than himself, impressed GesheLa so much that it was then he felt that he would like to become a monk. He sensed a strong connection to the spiritual way of life. His family objected to his decision because he was so young and they had planned for him to join in the family business. It was not until the death of his grandmother six years later, that they gave him their blessing to enter a Tibetan monastery. Due to the severe conditions in Tibet in 1979 when he was ten years old, he was taken by one of his uncles to live and work with the nomads, herding sheep and yaks in the Himalayas. It was lonely and dangerous work for a young boy traveling alone through the cold, dark mountains; but there was enough food to eat, and this gave him his first experience of utter silence and being alone with one’s fears. In 1982 at 13 years old, he entered the Nangzhig Bönpo Monastery, the largest Bön Monastery in Tibet, and took the “Getsul” monks vow. The Nangzhig monastery is located in the Amdo Ngawa region of Eastern Tibet. It was founded in 1108 AD by Yönten Gyaltsen, who is also known respectfully as Nangzhig Do Pag Chenpo. Later on, the monastery began to be taken care of by the Nangzhig Kyapgöns and the other senior lamas. Since its early history, this monastery has been one of the important monasteries in the Amdo region of Tibet. At fifteen years old Geshe YongDong began studying logic, Paramita (perfection), the middle way and traditional studies of Tibetan grammar, and poetry. In 1985 at 16 years old, he took his “Gelong” monk’s vow from his root teacher, Gyaltsap Tenzin Wangyal Rinpoche in Nangzhig Bonpo Monastery, Amdo, Tibet. His studies included debating, chanting, and drumming. His Dharma studies included Sutra, Tantra and Dzogchen, Hinayana, Mahayana, and all schools of Tibetan Buddhism: Bönpo, Nyingma, Sakya, Gelugpa, and Kagyupa. He also spent three years studying ritual, sacred dancing for the monastery, and traditional flute. In March 1992 at age 24, after debating on Sutra and Tantra for three days with hundreds of scholars; he was awarded the Rajampa Geshe degree at the Nangzhig Bon Monastery College, Amdo Tibet. 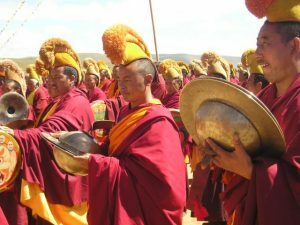 It takes a minimum of nine years of study to receive the Geshe degree, the highest degree awarded in Tibetan monastic education. In the spring of 1992, Geshe YongDong with 10 other Tibetans, escaped from Tibet into Kathmandu, Nepal. With the help of a Nepalese guide, they walked for 10 days through the Himalayan Mountains. He then travelled to Dharamsala, northern India and met with H.H. the 14th Dalai Lama. Geshe YongDong received many teachings, transmissions and empowerments while residing in Dharamsala India, from H.H.the14th Dalai Lama including: Yidam Jigshag (a Tantric Deity), one Madhyamika teaching called (Gongpa Rabsal) and Lam Rim – the path to enlightenment (both Lama Tsongkhapa teachings), and the Kalachakra empowerment. He began studying in the largest Tibetan Buddhist monastic universities of Sera in south India and the great Bönpo Menri Monastery in north India. He did in-depth studies on Sutra and Tantra including Dzogchen, both intellectually and practically under His Holiness the Menri Trizin and the great master, Pönlop Trinlyi Nyima Rinpoche. 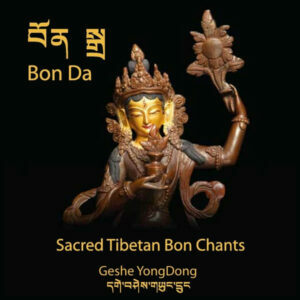 The Bon Religion is the ancient indigenous religion of Tibet founded by Buddha Tonpa Shenrab eighteen thousand years ago in western Tibet and continues to the present day by an unbroken lineage. Menri Monastery University was built in the 14th century in Central Tibet. It remained the main monastery of Bon and a premier centre of religious teaching and practice until the Chinese Cultural Revolution destroyed it in 1959. During that time, many Tibetans fled to India as refugees. His Holiness the Menri Trizin, the 33rdAbbot and The venerable Yongzin Tenzin Namdak Rinpoche of Menri Monastery, after many hardships re-established the present Menri Monastery in exile at Tibetan Bonpo Settlement, Dolanji (near Solan northern India), to preserve this unique and ancient tradition. The monastery offers advance religious training in Dialectical Studies. The 11-year course of study includes philosophy, logic, poetics, astrology, medicine, ritual and meditation, and the languages of Zhang-Zhung and Sanskrit. The monks also studies and practices the Bon tradition of Sutra, Tantra and Dzogchen. The training in Dzogchen includes the highest meditation practices such as the dark retreat and the visionary practices. At the Sera Monastery University, he again went through all the main Dharma studies, in particular, middle path philosophy Madhyamika, under the instruction and guidance of Master Geshe Thupten Rinchen. Sera Monastery follows its centuries old tradition and culture dating back to its great period in Tibet, to this present day without much significant change. As such the monastery continues to exist in a typical Tibetan Gelugpa monastic tradition to this day. In 1999, Geshe YongDong was invited and travelled to Paris, France to teach at the Yungdrung Bön Centre there. That was his first experience teaching in the west. Then in the fall of 1999, Geshe YongDong moved to the northern community of Kitimat, B.C., Canada. He focussed on learning about “western” culture and traditions and the English language and began teaching Buddhist philosophy in English, to groups of students. Since 1999, Geshe YongDong has taught in Germany, Holland, France, USA and Canada. In January 2003, Lama Geshe YongDong relocated to Vancouver Island, B.C., Canada where he founded the Sherab Chamma Ling, Tibetan Bon Centre. He is the Resident Spiritual Director and continues to regularly teach at his centre. A registered non-profit society was created in 2006. 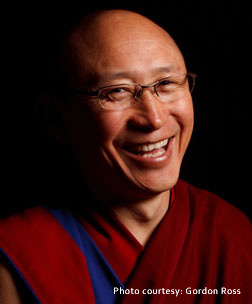 In May 2007 Geshe YongDong was granted Canadian citizen. Geshe YongDong teaches on a regular basis in Costa Rica and has established a devoted group of Bon students there, a Sangha known as the “Bon Da Ling”. He travels annually to teach in Colombia (Medellin and Santa Elena) where a group of students have created a Tibetan Bon Center, “Sherab Chamma Colombia” under his leadership. In 2013, Geshe La was nominated as the first Treasurer of the newly created Western Bon Lama Group. In 2014, he took on the job to coordinate and organize raising funds to support translation of ancient Tibetan Bon texts. The indigenous spiritual tradition of Tibet, Bön is among the world’s most ancient, unbroken spiritual lineages, tracing its oral history back 18,000 years. During the Chinese Cultural Revolution this rich heritage was gravely threatened. Countless monasteries in Tibet were destroyed, and many monks lost their lives. During the conflict only three senior lamas managed to flee the country; under great hardship they bore the responsibility for founding new monasteries in India and Nepal in the hope of preserving the sacred traditions. There, they taught new generations of monks—some of whom, like Geshe YongDong, chose to bring their knowledge and training to Western students. In 2013 Geshe YongDong became actively involved with the newly formed North American Non-sectarian Conference of Tibetan Religious Schools. He was part of the financial committee and in 2016 accepted the nomination for the position of Vice President. At the request of the Abbott of the Gelugpa Tibetan Centre in Vancouver B.C., Canada, in 2014 Geshe YongDong assisted in the preparations for the official visit of H.H. 14thDalai Lama. One of the greatest highlights of Geshe La’s life was to have the honour of sitting directly across from H.H. 14thDalai Lama during his public talks while in Vancouver. During this event, he was privileged to be recognized by H.H. who engaged him in a short conversation on his Tibetan Bon tradition. During 2014, Geshe YongDong began teaching internationally over the Internet. He continues to teach Tibetan people both in Tibet and the west, Bon and non-sectarian Lama’s, and even a group of Tibetan Bon Nuns in Tibet. In 2015, GesheLa was nominated by the International Gratitude Tenshug Organizing Committee to be the Bon representative of Canada. He chaired a meeting in Toronto, Ontario Canada and began the organizing process to form a Canadian Tibetan Bon organization located in Toronto. Practitioners and families would benefit from a central location to hold future gatherings of the Canadian Bonpo community to develop spiritual practice and to connect with each other. 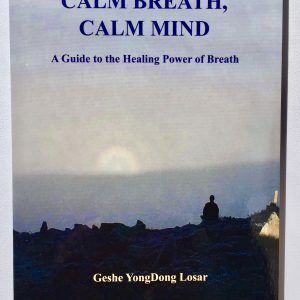 Since he arrived in Canada in 1999, Geshe YongDong has had a ‘heart’ connection with the First Nations People of Canada. He has attended and given teachings or talks at several of the larger International ‘Gathering’s’. He has met with several of the Chiefs and Elders to discuss the many similarities and concerns that both of their cultures have or are facing. Geshe YongDong has a dream and an objective to build a Tibetan Bon retreat centre on Vancouver Island, Canada. His plan is to invite monks from Tibet and India to teach classes and share their culture with western students. He also has a larger dream and commitment to introduce, teach and establish Yungdrung Bön Buddhism throughout Canada and the world.